Located on the west thumb of the massive Yellowstone Lake, the West Thumb Geyser Basin provides a water-infused environment both subterranean and above ground. Even in the parking lot of West Thumb Geyser Basin, gurgling geysers can be heard, and once out on the half-mile boardwalk, they can’t be missed. Between Abyss Pool, Percolating Spring, and Twin Geysers, there’s a lot to stop and see on the West Thumb Geyser Basin Boardwalk, including the underwater Lakeshore Geyser and Fishing Cone. 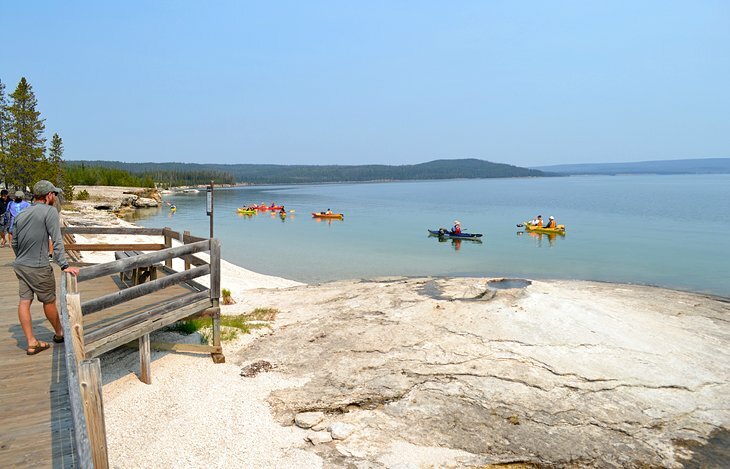 Adjacent to the sulfuric smell and bright colors of the basin, Yellowstone Lake, the largest lake above 8,000 feet in North America, offers welcoming views of the deep water, including the occasional guided kayaking tour near the shore.